1. You have to cut the yellow Police tape with a scissors. You can't tear it with your fingers. 2. Maggots don't taste very good... but it depends on who you ask. 3. Swabbing people's mouths for DNA is NOT an interesting job. 4. There is no typical crime scene, no typical body of evidence and no typical investigative approach. 5. There should be no sneezing in the vicinity of white powder. 6. Not all white powder is cocaine. 7. If the defendant does not take the stand, he's probably guilty. 8. The first thing a CSI does when he/she arrives at a crime scene is an initial walkthrough. 9. Detectives interview witnesses and consult with CSI technicians. They shouldn't play with the initial physical evidence. 10. What goes on in the lab or the Jefferson Institution (Bones) is called forensic science. 11. It's better to look at a crime scene in the dark with a flashlight because you can see better in the concentrated light. 12. Fingerprints are run through Automated Fingerprint Identification System (AFIS, which utilizes the FBI database) for comparison against hundreds of millions of prints. 14. BONUS: Never trust a blood-spatter analyst. Don't forget - if the sky is oranger than Horatio's hair, you've got to take a drink. Way cool, Mary. Gotcha on 14. I love that show! I know a little of that stuff. Been a cop for 15 years. Thanks for stopping by my place! Hope you have a great week! My T13 is about dorky things I say to my children. i love csi and bones! cool list you have here. Good show Mary. Hey I don't know if ya know but the Creative Photography contest list closed yesterday. Its on the post but I don't think some people read it. You killing me, teach :o) Great observations! Cannot wait for new CSI season to start...Hope there won't be a strike to postpone it. Great list. I always wondered why they looked for evidence in the dark. You forgot the fact that no matter who dies or where they always look in the BED! LOVE, LOVE, LOVE those shows (except Dexter...never seen it). I get very upset if I miss an episode! 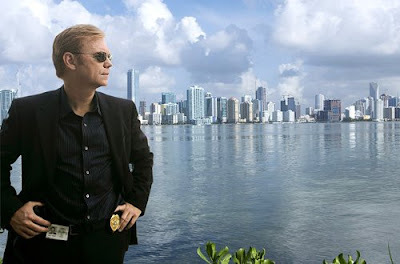 I am almost hyperventilating waiting for the new season of CSI: Miami. Horatio HAS to live!!!! I hope you will check out my T13. I posted 13 pics of my precious grand daughter. LOL @ Mo... Great list! HA! Nicely done - I love watching CSI, Bones and Dexter. Thanks for putting a huge smile on my face (esp. #14). P.S. :Thank you so much for all your kind comments during the pregnancy and on Lily's birth announcement. Thanks for the information. Didn't know there was so much I didn't know! I didn't know what an unsub was - thanks! 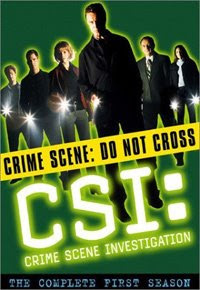 I love the CSI's and have never watched the other show. Don't forget, that if a CSI doesn't know what to do, just say the words "Mr/Mrs. So and So, get that to trace," because they have probably forgotten that vital step. I used to watch all those---until I started blogging! I am back from holidays since yesterday ! I haven't heard from you although I was blogging with application (hehe) every morning for an hour but for Google Reader I had no time. Just to answer some comments. So here I am and what I like at all CSI is when you look at one during your supper you have the pleasure to see open stomac contents, cut fingers, vomit, popping out eyes, beating hearts out of the body, gallons of blood flooding in all rooms etc etc. It increases your appetite ! Really !! I've tried to watch some of these CSI shows, but I can't get past the yuck factor.